The Parisian ‘ Symphony’ of the restaurant Alain Ducasse au Plaza Athenee, Place of Excellence, is orchestrated by Christophe Moret. Alain Ducasse and Christophe Moret have been collaborating for more than ten years. They offer with each passing season, resolutely contemporary French cuisine, where great importance is given to authenticity in order to reveal the hidden flavours of the food. One of the best table of Paris ... May be the one. The Paris Restaurants Guide is an excellent ressource to find and book online Restaurants in Paris. Currently featuring several hundred restaurants in Paris, including all the top restaurants but also the famous Paris Brasseries and Bistros, it is the definitive online guide that offers free online reviews and booking facilities... Just like in the theatre, a red velvet curtain in the brasserie entrance is drawn back to reveal a scene of different kind, one where an usher, dressed in sober attire, takes your coat and guides you to your table to present the culinary program. See our selected gourmet restaurants in Paris. 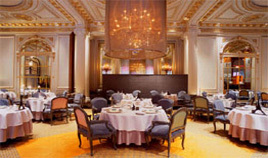 This page of the site is dedicated to Plaza Athenee Restaurant.